This Thursday (October 30th) we plant o have an opt-in beta which is basically a preview of Beta 2 (not quite done but getting there). 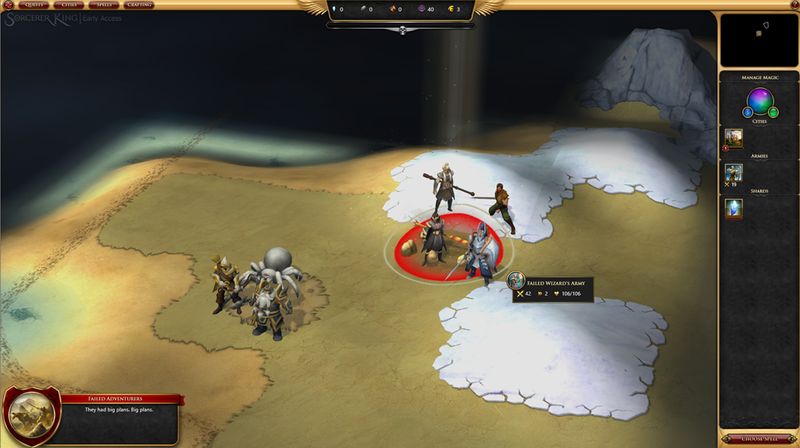 Minor factions in Sorcerer King interact with you purely from conversations. It’s not a trade screen ala GalCiv, FE, Civilization, etc. Instead, each one has specific things they can do for you (and to you) and gaining their favor requires doing specific things based on which minor faction they are. Between now and release, the minors will get much more fleshed out. We’re just putting in the skeleton of this system for Beta 2. You will need their help to win (or at least, you’ll need them to not side with the Sorcerer King). The guardian sovereign is the master of terraforming the world. She can raise and lower the land as needed. If you need to wall yourself off (or protect shards by surrounding them with mountains) you can do that. If you’ve ever played Populous, you will get an idea of what we’re going for here with the Guardian. We are really hoping that the Kumquat 3 engine we’re using that supports morphable terrain will differentiate Sorcerer King from other 4X games (such as Fallen Enchantress). We will be very interested in hearing the ideas of other players on other interesting things we can do here (and we’ll want it to come from people playing the game and not theory craft <g>). The Tyrant is modeled after Saruman. He’s envious of the Sorcerer King and fancies himself taking his place. The Tyrant can destroy shards and absorb their magic. He too can cast the spell of making. In a way, he’s in a race with the Sorcerer King to accumulate the power to destroy the world for his own ends. We got a lot of good feedback from Beta 1 and began implementing it here. For example, if the Sorcerer King won, why is the land relatively clear of his presence? Well, in Beta 2, he has garrisons around the map and strongholds start peppered around the map from turn 1. These strongholds train units, build improvements (different ones from you) and look to get even more land. They also spread the Shadow lands – land that has been corrupted. Shadowlands are utterly ruined but, for players who have enchantment books, they can be converted into fertile lands and be built on by the player. We also have Thralls in. As the Sorcerer King becomes more powerful, more and more of your citizens fall under his sway. Thralls are basically the same as units you build except, they don’t’ do anything. The cure for that is hope which can only be found through the sovereign’s skill tree (i.e. there isn’t a “hope building” here). 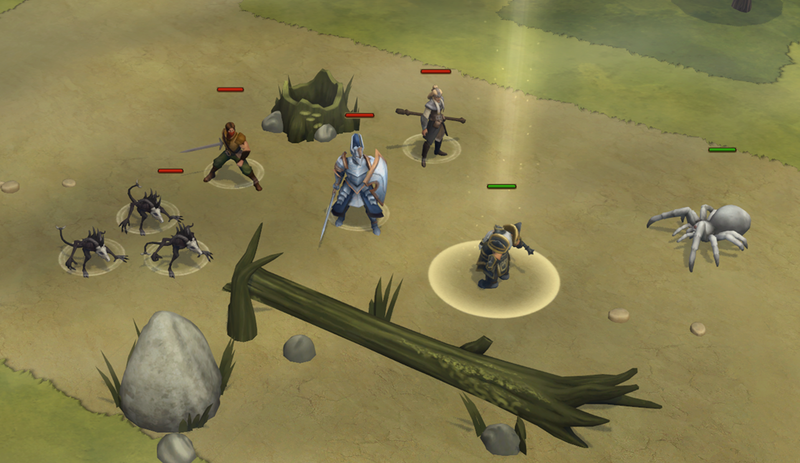 What we want to do with Sorcerer King is provide a clean slate to build on. 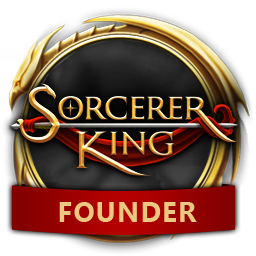 That is, we imagine releasing Sorcerer King early next year and then having yearly expansions based on player feedback until people don’t want them anymore. This means Sorcerer King itself needs to be a fun, tight, innovative experience. Right now, I can think of two excellent fantasy 4X games on the market that player can choose from – Endless Legends and Age of Wonders 3. We don’t want Sorcerer King to take away sales from these excellent titles so we want it to provide enough distinction that it’s not competing. This means we have our work cut out for us. Frankfurter and others have made a lot of outstanding suggestions on how the crafting system in Sorcerer King might be extended. What’s ironic, is that we already have a crazy powerful crafting system…in XML. If you open up coreitems.xml you ‘ll see that items have Game Modifiers on them. This is a techie way of calling them enchantments. We just never created a UI for them. We have been frustrated with the current crafting system in that it’s basically just a store with ingredients as currency. I don’t like it. Recipes provide the means to both create items and enhance them. A recipe for a sword might require some iron ore and oils to create. Then, based on their CRAFTING SKILL level (which ranges from 1 to 3 based on the sovereign they chose) they enchant it. The first level of enchantment is based on what magic books you selected: Chaos, Wrath, Enchantment, Summoning. Thus, these enchantments would be related to these books. The more, say Chaos books you have, the more powerful the chaos enchantments you can place on this sword. The second level is based on Mana. If you’re willing to spend the mana, you can do some fairly straight forward enhancements (+2 attack, +2 speed, fire damage, etc.) Nothing fancy here. The third and most advanced level is based on additional items ingredients you might have. This third level will tend to add new abilities to your units when the item is equipped. So maybe the weapon gives the unit the Smite ability or can absorb mana. When the balance is right, players who aren’t playing on beginner will feel like they’re up against crazy odds. That’s because they are. You won’t win through traditional 4X means. You’re going to have to nuke parts of the world. I don’t think there’s any way around it. You’re going to have to use powerful, world breaking spells to keep them back. You’re going to have to craft items and weapons and defenses that make the ultimate stack of doom. This game isn’t going to punish you for having a stack of doom. It’s going to punish you for NOT having a stack of doom. Make that stack of doom. You know you want to. Your stack of doom, however, will be going up against a very smart opponent. That is, I’m going to be personally coding the Sorcerer King’s units actions in tactical. It’s not going to be dice rolling here. I’m going to be looking at what you got and trying to counter you actively. You will need to look at what spells the Sorcerer King has gotten (this will be in Beta 2) and be careful not to run afoul of them. Obviously the different sovereigns have different units and their own unique skill tree (our tech tree equivalent). The goal here will be to make each type of player very distinct. Over the course of the game you’re going to run into a lot of quests that are where you get a lot of your special items, crafting ingredients, special units, etc. But you will also be making choices that will determine what kind of character you are (ala Ultima IV). So at the end of the game, when you meet the Sorcerer King, he will, in effect, be a mirror image of what you are. Right now, the end battle is the same no matter what. But as we go forward, the Sorcerer King will be the anti-you. 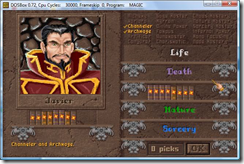 You won’t be selecting a specific Sorcerer King at the start of the battle but when you do reach him, you will be presented with a general summary of the way you’ve played that particular game and the particular consequences that will ensue as a result. For Sorcerer King to succeed at the level we want, we need to make sure it is truly unique. That is really stands out. This is the game that happens AFTER you lost the previous. It’s the consequence of the enemy having defeated you and the other 4X fantasy races. If you’ve ever played a 4X game where you’ve won and kept the other players in a zoo (i.e. down to 1 city and you own the map) that’s what the Sorcerer King has done to you. All things aren’t equal. You are up against vast numbers of opponents. Victory isn’t largely or even mainly about building a bunch of cities. The main point of cities is to provide logistical support for your units. The economy of the world is so shattered that money isn’t even a resource to use in the game (there’s no gold). You may have to do great harm to the world in order to win. We have maps in the beta that are very pretty (you may have noticed). But they won’t end up pretty. Are you really planning to risk wiping out your well crafted units to win? You can’t win by attrition. Your Civilization / LH / traditional 4X strategy won’t work here. This isn’t about the size of your army, it’s the quality of it. The Sorcerer King already won via force of arms. Your final army going into his realm needs to be as powerful as Sauron from that scene in Lord of the Rings. Because the Sorcerer King isn’t Sauron. He’s Morgoth who’s trying to become Eru. So Beta 2 is still due in early November. But the Opt-In beta is this Thursday. Obviously there’s still a lot to do between now and then but hopefully this starts to show you where we’re going. OK, so it looks like you have you mind set on the Civ V style of minor interaction. I could have sworn that you stated that the minors could battle the SK, but if they are nothing more than a menu of choices, and don't show up on the map, I'm not sure how that's going to work. All I ask, is that a picture of the minor faction is displayed while the player is going through the menu choices. Also, I really don't want a to be notified every few turns (like in Civ V) that I'm losing influence with the minor, and they'll no longer be my friend unless I go on yet another quest for them soon. From the way it was described, the guardian sovereign seems like a turtler. Can a turtle win this game? "the Sorcerer King will be the anti-you." Does that mean the SK will chose spells and abilities that will specifically counter the spells and abilities you choose. So if you choose fire, the SK will choose water...That could get repetitive and predictable. Good that you are changing the crafting system, because I didn´t really like it. I also felt it like some sort of shop. I also like the fact of no having gold to trully reflect a distressed world economy. Just be careful not to turn mana in the new gold, because if mana is going to be used for rushing units/buildings, to pay for some crafted items, and so on, it will end being gold with another name. The part about being trully outnumbered really feels cool, because it promises to keep the game challenging until the end instead of what is usually the end of "traditional" 4x games. The challenge here is to make it challenging without scripting too much. This cannot be like an RPG where the final boss is always your level plus X more levels, it has to be a sandbox world, one where the bad guy has a lot more resources, but a sandbox. I'm not sure how you got that from what I wrote. The minors are on the map, they have cities. They have units. You communicate to them via the map. There's no trade screen (ala Civ). Instead, it's conversations where you ask for things. It's more like Star Control in that sense. When you talk to a minor, you are talking to a race just like you would in GalCiv. It's just that you're not trading techs or whatever. Instead, you're asking for things unique to them. If they go to war with the SK, they'll e sending their trained units to attack the SK and his units. If they side with the SK, their units come at you. 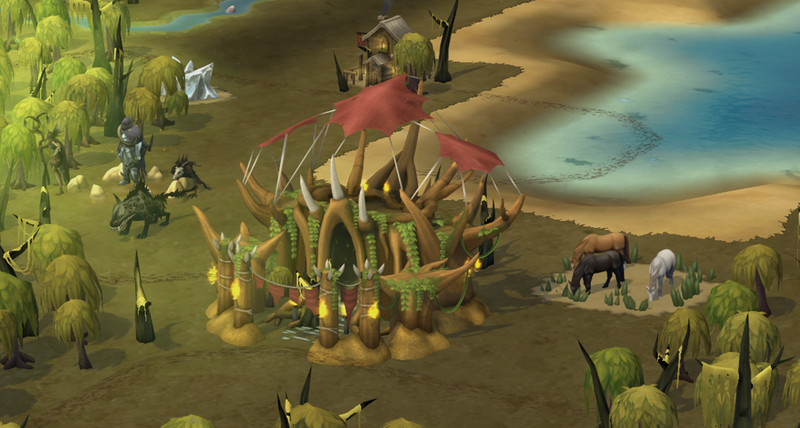 The first screenshot in the post is one of the Swamp Giants cities. You don't have to worry about that. The Sorcerer King would not lower himself to script his strength based on a mere human. This is exactly the kind of update I was hoping for. I am very glad to hear that you heard the feedback on the look of the world. I'm looking forward to maneuvering through a world that feels like the Socerer King has conquered it. Thanks for listening to us. I am also very happy to hear that you are overhauling crafting a bit. Your suggestions sound like a big step in the right direction. I've liked the idea of crafting and appreciate what it does for the game, but you (we, Franknfurter) are right when you say it didn't feel right. Good job. Lastly, I think you understand how to differentiate this game enough to make it a new experience. The synopsis you've given about how the game will play out does, in fact, sound much different than a game of Endless Legend or Age of Wonders plays out. The fantastic thing is that us 4X gamers will have all three (and more). It's truly a 4X golden age. It's why I started my site (/endshamelessplug). Keep up the good work, Brad and Co! Thanks for the update, Brad. I am looking forward to this! Otherwise, I could see myself camping a scout near their city and striking up a conversation every X turns. Then the minor factions would turn into little more than vending machines and that wouldn't be fun. This sounds great, can't wait to give the guardian a spin. Looking forward to this...and that is something as I currently have Divinity:Original Sin, Wasteland 2, Endless Legend and Age of Wonders 3 on my plate. Very excited to see minor factions go in, as I think this is what I'll spend my time modding the most. Brad, you mention Star Control as inspiration for the minor faction interactions often. Does that mean we'll see cool images of them as we speak to them, like in Star Control? I would really like to see that. OK, sounds good. I'm looking forward to having the minors fully implemented in the game! The last three weeks I have close to daily been checking the properties/Beta Tab to see if there was an opt in added. Now Thursday (Friday for me) and will be up and running, will not be able to stop myself starting a new game up, and if the proper beta 2 launch breaks it, well will just have to start another. Very much looking forward to all the new additions, even if still relatively bare boned. Have already been considering how to change my strategies with Beta 2 and now after what Brad has said, I think I may just go much more radical with this (something tells me, will still not be radical enough). First game I played was very traditional 4x style play. It is fine to promise thing which will be done. But I'm very cautios about promises of quality or emergent properties of things. I'd rather the sorcerer king be set in stone from the start, scaleable in difficulty but not changeable characteristics. There ought to be a weakness I can work towards, or even create through quests. If he's just going to adopt to whatever strategy I choose what's the point of choosing a strategy? This is all very intriguing/encouraging! Frogboy - Is any version of the Dungeon Master AI included in the opt-in or is that slated for a later time? Everything is looking great Frogboy. Only concern I still have is about randomization. Just how random will the quests/conversation system be? I know that you plan on putting lots of quests. I know about the dungeon master system and the world shaping depending on your choices, and that was great news. You said in a previous post of yours, that allying/helping a minor faction could deteriorate/prevent you from allying with another one. Does it mean that every game the number/kind of minor faction is random, but that "elves" will always be enemy of "dwarves"? Is it possible to have the conversation system to be randomized so that interaction with the minor factions is different every game, so that by choosing to ally with someone you never know with which minor faction you are going to be enemy (or not an ally) with. Same can be said about quests and their choices/rewards. If the consequences for the choices and their rewards are always the same, eventually you figure out which choice (or even worse, sequence of choices to manipulate the dungeon master into shaping the world the way you want) is the "optimal" most of the times (unless your quest design is so good that you can somehow make all the choices attractive enough). I think there should be more risk/reward and randomness involved. Like sure, the evil option will always be marked as evil (for the dungeon master, and you will always gain the "token" for having chosen the evil option), but what happens after I make my choice should have more possible outcomes. Like killing bandits following a quest choice leading a) to an ambush by their bandit friends, b ) simply finding their ill begotten loot or c) nothing happening. On the other hand, the "good" choice would have no risks of actual combat for example, hence the reward should be inferior. Also how often will the minor factions propose new quests? Will they keep proposing them and maybe offer different kinds of random rewards for completing them or once you "capped" the reputation with them you are done thinking about them and you can "milk them" for units and help every x turns? Now I know I am probably asking for way too much, and maybe it's beyond the scope you had in mind for minor factions. Just the first things that crossed my mind, but in general, more interaction since the system is based around dialogues. So for now these are my thoughts, sorry if something is not comprehensible enough, English is not my mother tongue so if there is something in need of a better explanation just let me know. 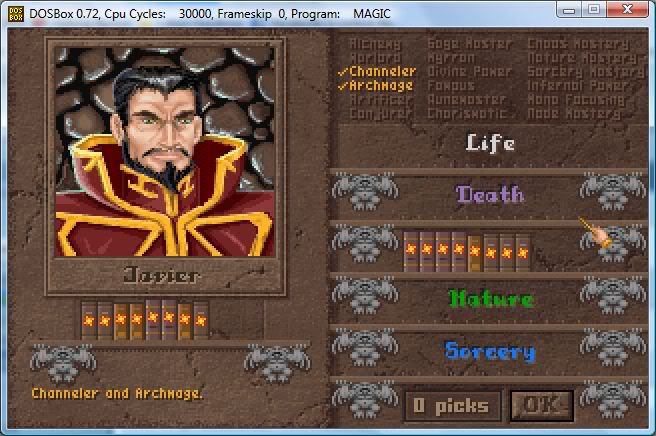 please just make a carbon copy of Master of Magic already. a dedicated fan of your games and Master of Magic. I thought everyone liked the crafting system, I saw enough post that supported that theory. I liked it anyway, in fact it was the best thing in the beta. I hope you don't spoil it. you're going to end up with a scenario where the player only crafts a very few handful of items which they can afford to pour EVERYTHING into, to craft that One Ring of Power or Excalibur. "Your final army going into his realm needs to be as powerful as Sauron from that scene in Lord of the Rings"
I need my One Ring to make my own Sauron. A ring of +2 defence or +1 sight just isn't going to cut the mustard, not for the epic fights and not if you want each sovereign to play differently. I could be wrong, but I think I'd be wrong from one perspective and not wrong absolutely (if that makes sense). Anyway, I'm looking forward to trying the changes and seeing how it feels. *Fingers crossed* it all works out. Is there an advantage of building multiple libraries e.g. one in each city?